Will my Homeowners Insurance Cover a Roof Leak? Roof Repair or Roof Replacement??? TRM Total Roof Management on Will my Homeowners Insurance Cover a Roof Leak? metal roof painting on Will my Homeowners Insurance Cover a Roof Leak? Jim McCormack on Roof Repair or Roof Replacement??? How To Never Have to Worry About Your Leaky Balcony or Walk Deck again! There’s a great deal of Phoenix roofing contractors who advertise balcony or walk deck repair, many with some sort of coating roll on type of solution. What if there was a proven permanent solution to balcony leaks that allowed you to never have to worry about your balcony or walk deck again! What if there was a permanent solution that you could enjoy a good Arizona rain without worrying about you balcony or walk deck. 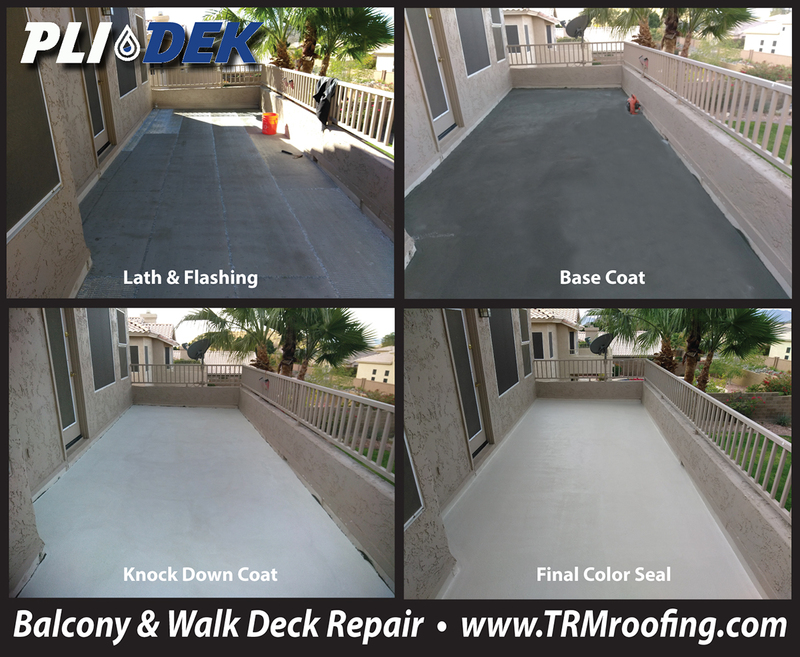 Well, now you can with a PliDek Waterproofing System! PliDek has developed the ultimate way to save your leaky deck in 4 easy step economical process. Ask your Phoenix roofing contractor about PliDek and how it can virtually ease all your concerns about a leak balcony or walk deck. Your Balcony Restoration Specialist will inspect your deck and will identify issues, some obvious other may not be. They will inspect your flashing around the perimeter, the scuppers, and the current system. Step 1: A floating patch is installed over every major crack or split. New wall counter flashing may be installed if needed. The metal lath is mechanically fastened to your existing deck. Step 2: A waterproofing base coat is applied. The installer will apply this waterproofing base coat with a trowel. It will evenly be distributed across the lath and feathered into your scuppers. Step 3: After the base coat has cured all uneven areas will be grinded down to ensure the smoothest surface as possible. Then the next layer is applied, the knock down coat. Step 4: After this second coat is completely cured the final color seal is applied. This can final seal coat comes in several colors. Next Next post: Did You Know Hiring a Roofer is Like Getting Married?